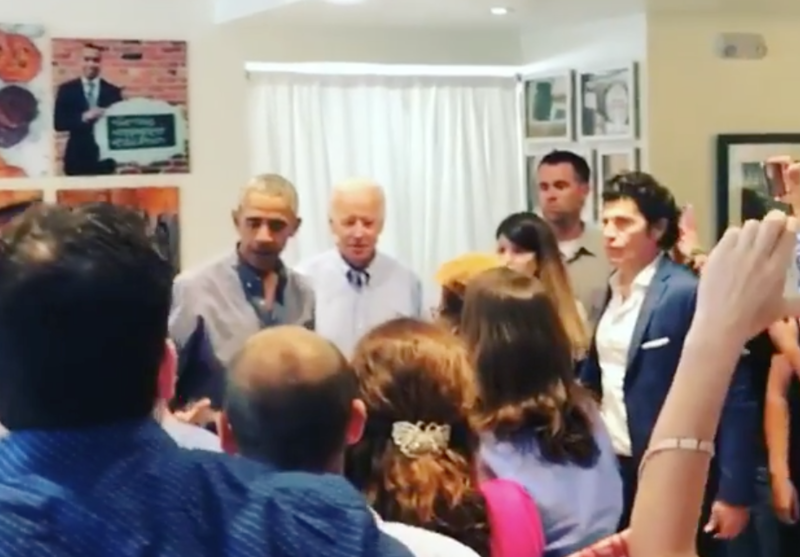 Former President Barack Obama and Vice President Joe Biden were spotted together shopping for goodies at a bakery in Washington, D.C., on Monday. Their surprise stop at Dog Tag Bakery in Georgetown led to a frenzy among onlookers, all trying to take photos with the political luminaries. Obama and Biden, known for the close friendship that developed during their White House tenure, were photographed buying treats at the bakery, which has a special mission. Dog Tag Bakery says it's dedicated to "empowering veterans with service-connected disabilities, military spouses and caregivers." According to their website, the shop is all about "baking a difference." After they made their purchases, the former president and VP smiled for photos and shook hands with patrons and fans. Pictures of them circulated on social media. "Some great guys stopped by," one Instagram user wrote. "It was wonderful to see them and also for the awesome folks at Dog Tag to get this nice recognition. Not too bad for a Monday!" wrote another. Their bakery run comes less than two weeks after Mr. Obama delivered a major address in South Africa, where was invited to give the 2018 Nelson Mandela Annual Lecture. He touched on the problem of racism, the "politics of fear," and the threat posed by rising authoritarianism worldwide. As for Biden, he still mulling over a 2020 presidential run –– an idea seemingly cheered on by President Trump. While speaking at a forum earlier this month in Bogota, Colombia, Biden said he would decide by January if he will run for president.